History of Kelly's Cider John J Kelly's Irish Cider was started in 1997 by Brendan Daly from Dublin and John Cronin from Kerry. Daly worked for a large drinks company in Tipperary doing Quality Assurance and Product Development and Cronin was a pub owner in Listowel, Co. Kerry. Both had previously lived in the USA and knew of the growing demand for cider there. Thousands of young Irish had immigrated to the USA in the 1980's and this group was the initial target market for the cider. 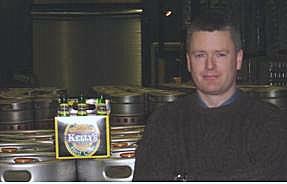 Daly had made cider in Tipperary for several years before starting Kelly's Cider. The initial plan was simple: import the cider in bulk and bottle it in the USA. Traditional cider is made from bittersweet cider apples which are grown in Ireland, England and France. These apples are only grown for fermentation and are not used for eating or cooking. They are usually very astringent with high tannin levels. These cider apples are not grown in the USA. In the 19th Century, cider was very popular in the northeastern USA. Very large quantities were consumed even after German immigrants introduced their new lager beers. The introduction of Prohibition ended the production of hard cider in the USA. Old, established orchards of bittersweet fermenting cider apples were cut down and farmers switched to other crops. After the repeal of Prohibition, cider never made a comeback. Beer companies lobbied to have a lower tax than cider and farmers could grow barley very quickly. A productive orchard of bittersweet cider apples would take many years to grow to a high productivity level. Beer quickly became the drink of choice in the USA. The demand for hard cider began in the 1980's when thousands of young Irish went to live in the USA. Cider is well established in the Irish market. It is especially popular during hot summer days. These young immigrants began drinking cider in bars in New York, Boston, Chicago and other 'Irish' cities. From this core business, cider was introduced to the American customers and it has grown in popularity ever since. Kelly's Cider is bottled under license agreement by the Florida Beer Company in Melbourne, Florida. It is fermented from the juice of 4 different traditional apple varieties. Unlike other Irish ciders it does not use fake orange coloring. It is currently sold in 4 states and is available in bottles and 15.5 gallon kegs.